For Christmas 2012, I received an unexpected present from a friend. The accompanying note explained that he'd acquired a second copy of a beloved book from his childhood and had thought of me as someone likely to appreciate it. 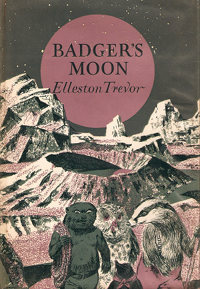 The book was Badger's Moon by Elleston Trevor, and appreciate it I certainly did. Who was Elleston Trevor? A prolific writer across a variety of genres, under several names. He is most famous for the novel Flight of the Phoenix, which has been filmed twice, and for his series of spy stories starring an agent named Quiller (as in Memorandum). He also wrote a large number of books for children, including Scamper-Foot the Pine Marten, Ripple-Swim the Otter, and Wumpus, which stars a koala. He was born in 1920 and died in 1995. 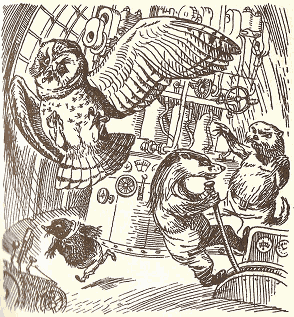 Badger's Moon is part of a series of children's books featuring the Woodlanders. These anthropomorphic creatures inhabit an idyllic, timeless landscape of hills, woods and rivers, rather like Winnie-the-Pooh's Hundred Acre Wood or Mole and Ratty's Riverbank. Other titles in the series include Mole's Castle and Sweethallow Valley. The Woodlanders refer to themselves as 'folk', a word which seems to mean both 'person', as in 'A folk feels like having a puff or two at his pipe', and 'old chap', as in 'Are you awake, Digger Mole-folk?' Like Pooh and his stuffed-animal friends, the folk are generally good-natured, not too bright, and highly food-motivated. One exception to the 'not too bright' rule - or is he? 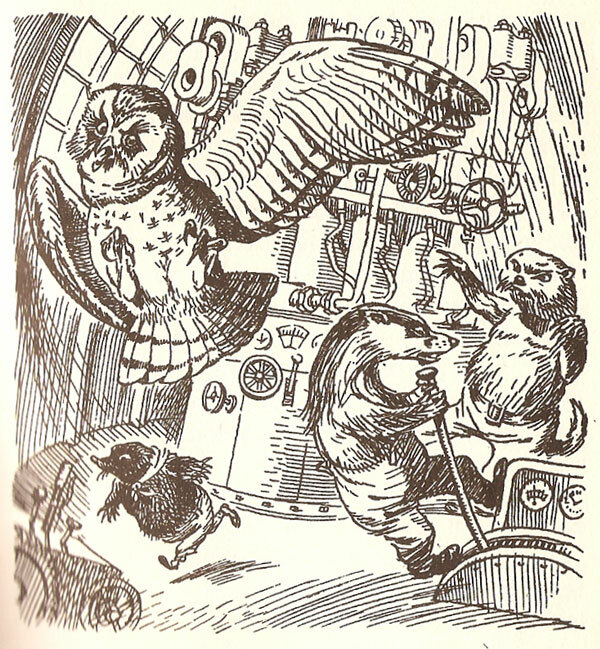 - is the Brown Wizard, a squirrel inventor who has succeeded in creating a rocket that will take him and his friends Old Stripe the Badger, Potter-the-Otter, Digger Mole and Woo Owl to the moon. Due to user error, the rocket takes off without its creator, and the other four find themselves hurled into space with little idea how to fly or land their vehicle. 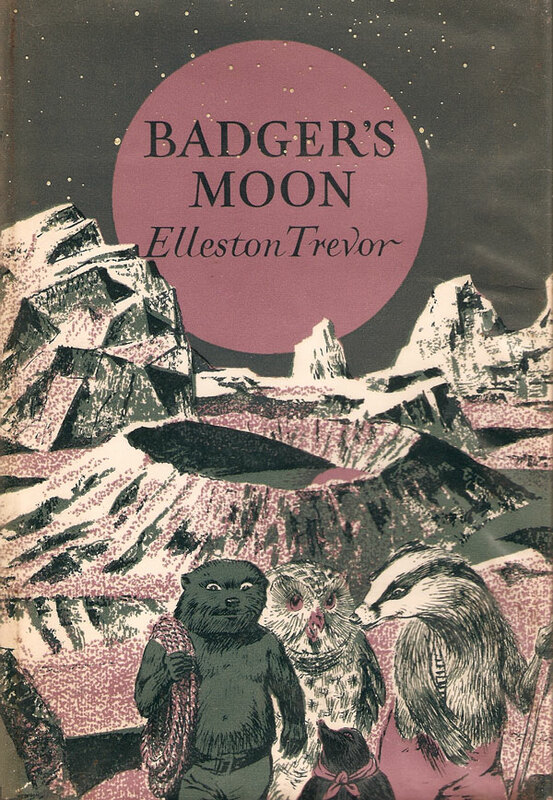 In 1949, when Badger's Moon was first published, a landing on the moon was twenty years away. It was still two years off in 1967, when my edition was released. 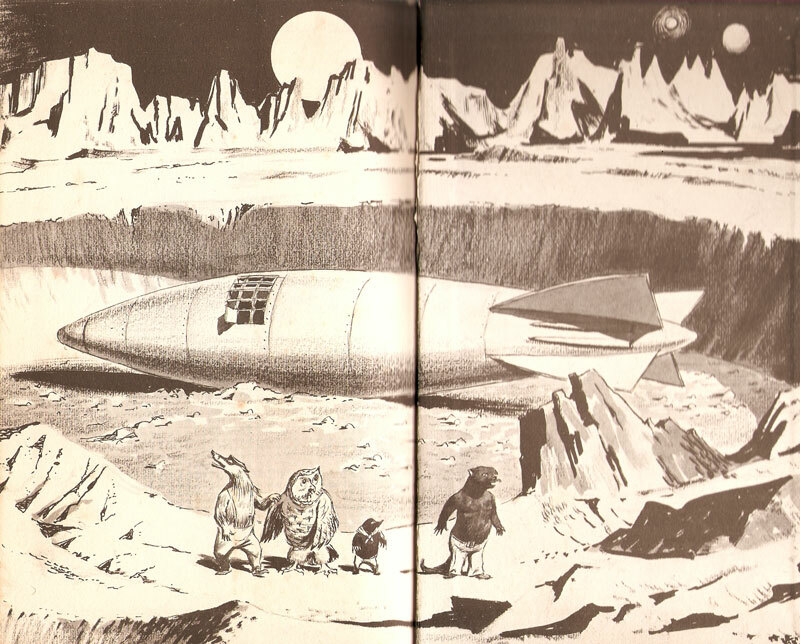 Even so, few citizens of the Jet Age can have believed that the moon would be inhabited, or that it would be possible to survive on its surface without special equipment. Yet this sits well with the rest of the talking-animal fantasy, giving it a dreamlike appeal. You'll either find this kind of old-fashioned whimsy quaint or annoying. Personally, as you could probably guess if you've read any of my fiction, I enjoy it and am sorry it's gone out of style. If you're a writer or editor you've probably heard of 'crutch words', words or phrases authors lean on without being aware of it. Trevor's crutch word here is one I'd never even encountered before, 'deedily', used at least once a chapter to describe someone's speech. (It means 'actively, industriously, earnestly', according to my dictionary.) This repetition was the only major irritant for me. There is a lovely quality to the black and white illustrations by Leslie Atkinson, which mix fantasy and realism in the manner of the best children's classics. I particularly liked the endpapers, the front illustrating industrious critters working on the Rocket, the back showing the four friends walking across a lunar landscape. The illustrator himself was a former Naval camouflage expert who at one point during the Second World War was arrested on suspicion of espionage while making sketches in the city of Bath. Badger's Moon is a charming, gentle fantasy in which nothing truly scary happens to anyone; a perfect bedtime story. It is surprising that this and the others in the series aren't better known and have not been reprinted more recently. Since they haven't, secondhand copies, even ex-library editions, are rare and collectable. If you see this or any others in the series, do snag them, as they only turn up...well, once in a badger's moon!